Since the day of her birth, Princess Faedrah Austiere has been defined by her place within the kingdom. As the single heir to the half-blood gypsy king and his prophesied white queen, she is fiercely protected, shuttered inside an ivory castle and well-trained in the art of war. Yet neither her obligations as future queen nor the black infestation threatening her kingdom fail to hinder the mysterious pull of the antique armoire hidden in her parents’ bedchamber. And stealing the golden key for a leap through time is the only way to confront the dark lord haunting her dreams. One face. The image of one defiant, relentless woman has been stuck in Rhys McEleod’s head ever since he was old enough paint her luscious curves on the canvas. But the day she walks into his life off the street—sexier than hell and itching for a fight—he’s not convinced she’s the same women he’s envisioned since childhood. That is, not until he spots the golden key around her neck—an object he’d never fully shown in any of his paintings. Now if he could just persuade his lovely muse he’s not the enemy. Unless the elusive Faedrah Austiere learns to trust him, he’ll never have her in his bed—the one place he’s convinced she belongs. For me, this novella can easily be summed up in two words ‘abso-positive-lutely fan-frickin-tastic’. I couldn’t put it down from the first page. Nuest’s fast paced, exciting writing keeps you hooked. The exciting and captivating storyline let my imagination soar. It’s completely original yet still easily recognizable as a fantasy tale. Her descriptions are ones that bring this world to life before your eyes. Nuest gives you the smallest details of the scene so you can get the full picture of the setting, the characters, of everything. 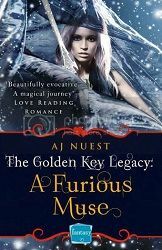 Nuest fills this novel with approachable yet larger than life characters. Faedra is fantastic. She’s the type of character that you want to jump into the story and help along. Nuest develops her in such a manner that you get to know her as an individual while at the same time there’s so much more about her to learn in the future novellas. Paired with her biker boy counterpart you have a winning team. 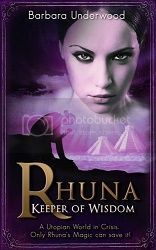 Emotions run high in these characters as their wants and needs collide in an unimaginable way. I love the sharp contrast between the characters from the past and those from the future. Cultures clash and dialects stand out in a fantastic battle of wills and wants. The dialogue has a brilliant and natural flow to it while having its own tone and timbre to suit the land. This first novella in Nuest’s new serial is absolutely unforgettable. It is a vividly colourful tale that launches Nuest’s new series up and beyond the others.